Following the destruction of Jerusalem in 586 B.C., Nebuchadnezzar appointed Gedaliah governor of Judah (2 Kings 25:22). Gedaliah established an administrative centre at Mizpah, identified as Tell en-Nasbeh, approximately 12 km north of Jerusalem. A number of army commanders rallied around him, including Jaazaniah (25:23). The army commanders warned Gedaliah of a plot to take his life, but he dismissed their cautions (Jeremiah 40:13-14). Gedaliah was subsequently assassinated along with “the men of Judah and the Babylonians who were with him at Mizpah” (2 Kings 25:25). A high-quality, onyx seal with the inscriptions “Belonging to Jaazaniah, servant of the king”, was discovered in a sixth century B.C. tomb at Tell en-Nasbeh. It appears that Jaazaniag was among those killed defending Gedaliah at Mizpah and that he was buried there, along with his seal. The man resonsible for his assassination was Ishmael, of the royal family of David and “one of the king’s officers” (Jeremiah 41:1). Ishmael was evidently trying to reestablish the Davidic line of kingship. 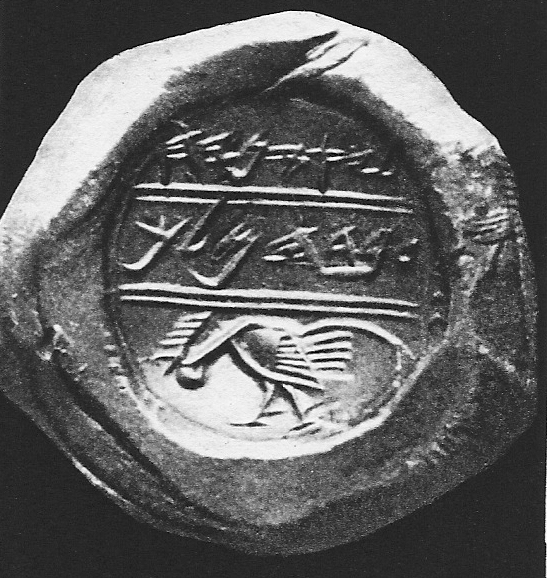 A bulla (clay seal impression) purchased from an antiquities dealer in Jerusalem bears the inscription “Belonging to Ishmael the king’s son”. The style of the script is from the late seventh or early sixth century B.C., and the bulla had been baked in a fire, possibly in the one set by the Babylonians. It is likely that the bulla is that of Ishmael the assassin. Another bulla, purchased in Jaffa and bearing the inscription “Belonging to Elishama the king’s son”, may have been made by Ishmael’s grandfather (2 Kings 25:25).